Which side are you on? Get ready to fight for your faction’s cause by pre-purchasing World of Warcraft: Battle for Azeroth, now available at selected retail outlets across Europe. Picking up a Standard Edition pre-purchase box before the expansion’s release this summer* will let you upgrade your account to Battle for Azeroth immediately and begin your journey to recruit four new Allied Races. Alliance players can add the shadow-touched Void elves and valiant Lightforged to their ranks, while Horde players can bring the ancient Nightborne and noble Highmountaintauren into their fold. Additional Allied Races will be available in the future. 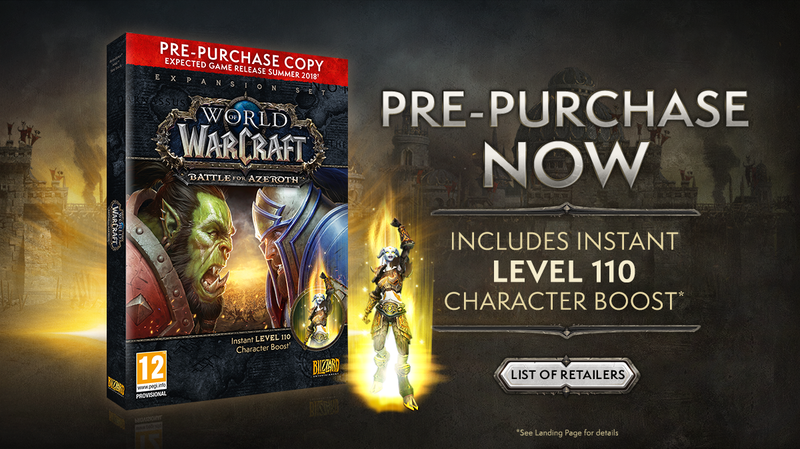 Pre-purchasing Battle for Azeroth also immediately grants the included level 110 character boost! The pre-purchase retail box is only available before launch and doesn’t include a physical game disc—instead, everything is linked to the digital code inside. Apply it to your Battle.net account and the content will be automatically downloaded through the Battle.net app, so you’ll be able to play Battle for Azeroth as soon as it’s released*. You’ll find a list of retailers in your region offering the pre-purchase box below. Battle for Azeroth is also available for pre-purchase via Battle.net, where you can find out about upgrading to the Digital Deluxe Edition. *World of Warcraft: Battle for Azeroth will launch on or before September 21, 2018. Pre-purchasing World of Warcraft: Battle for Azeroth makes available quest lines that enable players to access the Highmountain tauren, Lightforged draenei, Nightborne, and Void elves. To unlock Allied Races quest lines, players must have a level-110 character and have met specific questing and reputation requirements on the factions each Allied Race is aligned with. Players upgrading from World of Warcraft Starter Edition must wait for trial restrictions to be removed (up to 72 hours) before using character boost.